Gun blood is an attractive western shootout game. 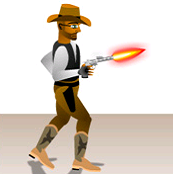 Target of the game is to become the most frightened gunslinger by defeating all cowboys in one gun fights. Move your mouse over the gun chamber, then wait three seconds, and when the countdown becomes 0 FIRE, shoot your opponent kill and win the round. Much fun with Gun Blood! During play Gun Blood you can feel the old cowboys emotions, you can hear every bullet sing by yourself and the smell of gunpowder becoming stronger with every level and much more degree. Between the various duels with your enemies and you can enjoy the bonus rounds where you must use your skill to get as many points. This game is most popular all over the world. 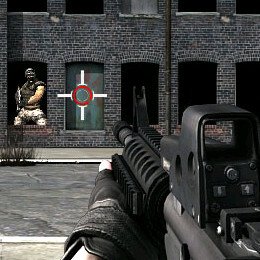 Place the mouse on the gun barrel for starting duel. When the countdown becomes o start FIRE! on target and shoot with the mouse. Did you enjoy GunBlood ?